Sean Brady at Mickey's Beach. 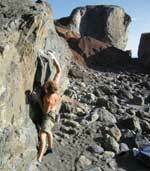 The Bay Area has over 600 documented boulder problems from classics on the beach to foothils. Below are some of the best. Sean Brady warms up on Heavy Metal (V0). Charlie Barrett on Ganesh (V7). Charlie Barrett clings onto Manitou (V11).